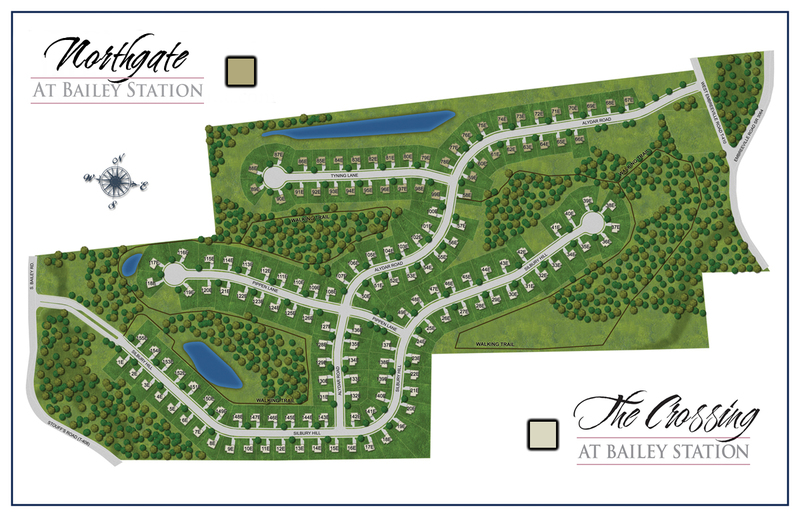 The Crossing at Bailey Station | Provident Homes Corp. The Crossing at Bailey Station is one of four communities which make up Bailey Station; a Conservation Community preserving over 100 acres of open space in the heart of Chester County, PA. The Crossing is located in Downingtown within walking distance to the Thorndale Train Station in Caln Township. The train station is an invaluable benefit to Bailey Station and our homeowners who use it daily to commute to work or for an evening out in Philadelphia. With easy access to Routes 30 Bypass, 322, 100 and 202, and located just seconds from Lancaster Avenue, there’s shopping and recreational activities abound. The Crossing at Bailey Station offers 113 lots, many of which back up to the community’s protected woodlands and offers gorgeous scenic vistas. You’ll immediately notice the curb appeal of this luxury sidewalk community through the Belgium block curbing, dusk till dawn lamps, coordinating mailboxes, and exceptional exterior home designs. Come walk the lots and choose the perfect location for your new energy-efficient, HERS Certified Home! We invite you to visit our Huston Model Home, which is open every day of the week from 12pm – 5pm or by appointment. We look forward to showing you our community, lots, home plans and helping you to personalize your home to you and your family’s needs! With a rock solid reputation for customer service Provident Homes asks you to go Green with Provident Blue!